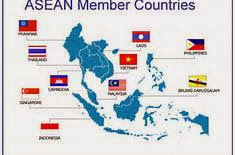 GDP of ASEAN - US$2.2 trillion with potential growth of 5%-6% p.a. Population exceeding 600 million, with relatively young demographics and a per capita income averaging US$3,800. Young work force (age 15-64) exceeding 310 million viz 115 million in Indonesia, 50 million in Vietnam, 40 million each in the Philippines and Thailand, 27 million in Myanmar and 12 million in Malaysia. Under rich are Brunei and Singapore, Middle-income ... Indonesia, Malaysia, the Philippines and Thailand; and Poor ... Cambodia, Laos, Myanmar and Vietnam. Rich resources, attracting continuing inflows of foreign direct investment-FDI (US$110bil in 2012). External trade totalling US$2.5 trillion in 2012; but trade among themselves (intra-Asean trade) remains small – at only 26% of the total, against 75% to 80% in the 28-nation European Union (EU) and 55% under the North America Free Trade Area (Nafta). Relatively open borders among themselves, allowing vast numbers of workers to move within Asean seeking higher wages and better employment opportunities, helping to level the playing field across the region. But domestic political pressures reflecting growing nationalism and social infrastructure constraints are working against fuller and faster integration anytime soon, limiting progress to only baby-steps.